The Huntington Manor Fire Department responded to an MVA after an SUV crashed and overturned on June 23, 2018, at Wolf Hill Road near Crandon Street. 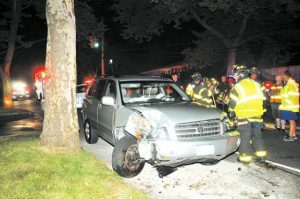 The driver was transported to Huntington Hospital by the Huntington Community First Aid Squad with minor injuries. Two Huntington Manor trucks were under the command of Chief Mike DePasquale and Assistant Chiefs Jon Hoffmann and Chuck Brady.